In 2011 I started working on a series of images based upon memories from places I had previously experienced or that I imagined about locations with a symbolic meaning in maritime and expeditions history. 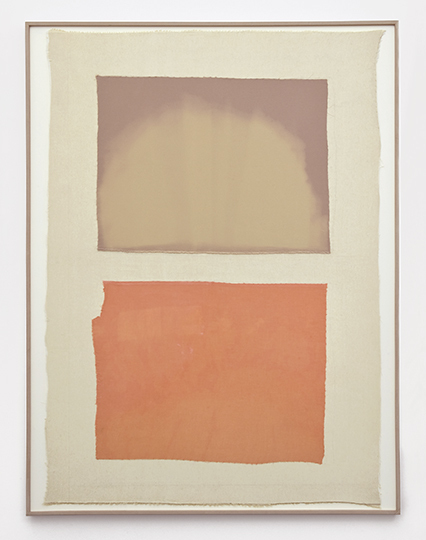 Defined by an apparent overall abstraction and a scarce depiction, some of these images were obtained by color substraction, using bleach water on colored fabric, while others were drawings on paper. They were titled according to specific sites, such as Plymouth (town on Massachussets known as the site of the colony founded in 1620 by the Pilgrims, passengers of the famous ship the Mayflower), Rockaway, (urban beach in Queens borough in New York City) or Kauai, (one of the islands of Hawaii archipelago). The images did not represent anything concretely but more of a feeling, sensation, a projection about that place. A pure mental construction with no details. The color obtained by dyeing was an association of the color of the light, atmosphere, or nature I had seen or imagined.